After a two-year hiatus, Litespeed’s TT bike is back and looks sharper than ever. Re-introduced in September 2008, after a two year hiatus, the Litespeed Blade is a bike with a storied history. The signature titanium airfoil tube shape was created by accident in the early 1990s and brought to widespread prominence when Lance Armstrong used one (disguised as a Trek) in the 1999 Tour de France. Ten years after that historic ride, Litespeed is wielding a totally new Blade, and we had a chance to check out one of the first bikes to leave the test lab. Blade Re-Sharpened: The new Blade has super high-profile frame tubes. I drove to Moab, Utah, a month ago for a training camp with Chip Chilson of Aspen Sport Performance. The Litespeed Blade ridden by Chilson is the first to be released outside of the company. Litespeed engineer Brad DeVaney met Chilson a few years ago at an Interbike dinner and felt that he would be a good candidate to test the prototype Blade. Blade Re-Sharpened: The new Blade has downtube cable routing and an under-stay rear brake. Though the geometry on Chilson’s Blade is custom, it gave DeVaney a chance to test the capabilities of the manufacturing process. “We’re also creating tools and fixtures to build the bike while we build the bike,” said DeVaney. The process used to create the dramatic titanium tube shapes requires innovative methods and tools that didn’t exist until the design of the Blade was created. More than ever, the storied Litespeed time trial bike lives up to its name. This new Blade has drastically flatter tubes that taper off into a sharp edge. Using 3/2.5 titanium, a more malleable alloy branded “T1,” Litespeed is able to achieve the ultra-narrow tube profiles for the Blade. A front view of the Blade shows the efforts that were made — the frame has a broad side profile and minimal frontal area. The seat tube similarly takes an extreme approach to aerodynamics and to match the effort, Litespeed created a bladed seatpost. 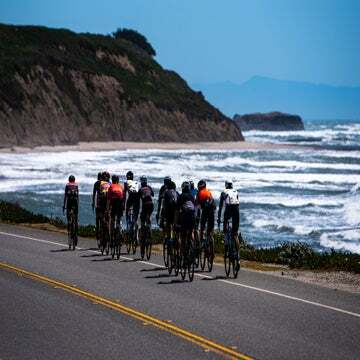 Finally, the top tube is triangle-shaped, flat on top and pointed on the bottom, providing added lateral stiffness with minimal side and frontal exposure. Blade Re-Sharpened: The downtube is left open at the bottom. The wing-like downtube also functions as a conduit for internal routing of the rear brake and derailleur cables. Cables enter near the headtube and exit the open-ended downtube at the bottom bracket junction. 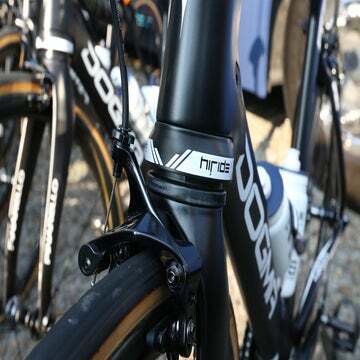 As on a growing number of time trial bikes, the rear brake is mounted to the chainstay bridge for maximum aerodynamics. To complete the package, Litespeed designed a matching titanium aero fork. As a gesture to the stealthy aesthetics of the frame, the logo is printed in black and placed on the inside of the fork, keeping the visible side uncluttered. Blade Re-Sharpened: The bike is almost two-dimensional. In this era of carbon fiber, a material permitting almost any frame shape imaginable, a titanium time trial bike radically bucks the trend. But the Blade has a legendary history that lends credibility to this latest iteration. Blade Re-Sharpened: Notice the shape of the top tube and the narrow profile. After the initial discovery, Litespeed developed a more consistent, cost-effective process of manufacturing tubes for the Blade. After four years of research and development the Blade was first brought to production in 1995, said Litespeed’s Chris Brown. DeVaney then worked with Steve Hegg and Lance Armstrong in 1996 on building the best available time trial bike. Hegg won his third elite U.S. national time trial championship and Armstrong won the final time trial (and overall) at the Tour DuPont in 1996 on a Blade. Blade Re-Sharpened: That’s no Trek under that paint. In 1998, Armstrong called DeVaney seeking a UCI-legal time trial bike for the 1999 Tour de France. He went on to race the prologue and time trial on a Blade, painted blue with Trek decals. Not only did Armstrong famously ride a Blade, the RLX Polo Sport triathlon team used the Blade in 2002 and 2003, as did the Lotto-Adecco team at the 2002 Tour de France. Now after 14 years and 12 generations of the Blade, Litespeed has once again designed a time trial bike unlike any other on the market. Even though Chilson’s frame is a prototype, the design is virtually complete. “It’s down to aesthetics,” says DeVaney, “When a bike is at that segment of the market you just don’t make any compromises.” By “aesthetics,” he means the slightest details of joints and welds, not so much the shape of the main tubes. Due in part to the high price tag of the new Blade, upwards of $10,000, DeVaney expects that a good percentage of these bikes will be made with custom geometry — Litespeed has the capacity to make every Blade fit like a glove.